Before you run to Target for this week’s Diaper Deal, READ THIS! First off, 12¢ and 36¢/diaper for Swaddlers or Baby Dry is NOT an amazing price. It is certainly not a “buy cases of diapers at this price” price. In our Facebook Group, Kidz Steals & Deals, we regularly feature diaper deals, often from Amazon & Jet.com for as low as 8¢/diaper. 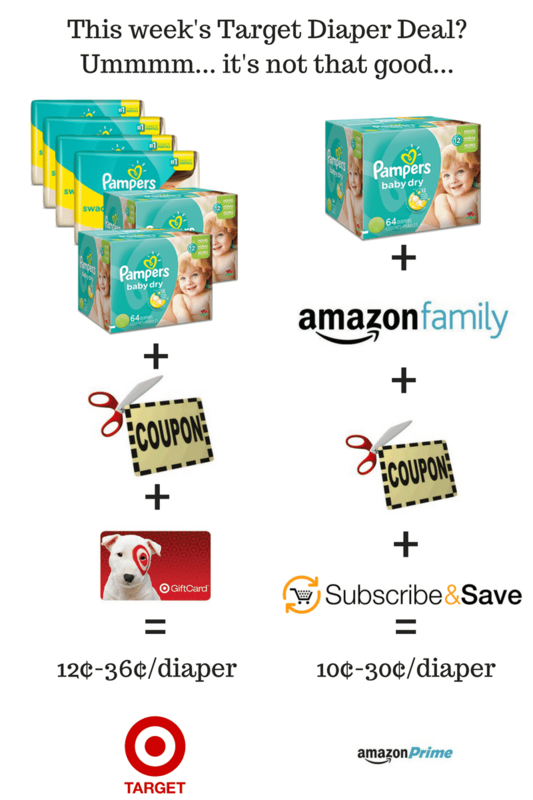 It is important to note that Amazon Diaper Deals do require an Amazon Family Membership (free with Prime) + Subscribe & Save, but subscriptions can be cancelled at any time. If you are not a Prime Member, you can grab a 30-day trial here! It turns out, that with an instant $3 coupon, Amazon has an option for Baby Dry and/or Swaddlers in every size that is cheaper than this week’s Target Diaper Deal! With the exception of a couple sizes, Amazon’s price per diaper is at least 5¢ CHEAPER! If you assume a child uses a minimum of 6 diapers/day the minimum savings of 5¢/diaper, you save a MINIMUM of $110/year on diapers. Consider that Prime Membership paid for (and you haven’t even bought anything else yet)! If you have a child in diapers or are expecting, I do highly recommend becoming a Prime Member. The $99/year cost is easily justified by the benefits. They frequently have diaper, wipes and baby food deals that pay for the membership in a couple of months. In addition, we frequently use Prime Video, which even lets you download some movies and TV shows for offline use (super handy for trips). Finally, if you follow our Facebook group, we frequently post deals that are below the free shipping threshold for non-Prime members. You can save a TON of money on everyday household items, toys, clothing and shoes! You can sign up for Prime or grab a 30-day free trial here! If you are pregnant, you can even set up a Registry here for even more savings (no worries, it can be private)! Prime Members get a 15% off coupon for registry completion! Next Post Jet Clean Living Promo – Big Savings on Method Cleaning Products!